• Digital business grew by 23 percent in 2016, double the objective set for the year. • VERTI will start operating in the United States in the second half of 2017. • The profitable growth strategy is strengthening the company’s competitive position in the main markets. • Revenue growth could ease but premiums will continue growing at expected rates. • ROE will exceed 11 percent in 2018. The US dollar and Brazilian real appreciation together with low interest rates in Europe make meeting the initial objective more demanding. • The expense ratio stood at 27.4 percent, with a saving of over 60 million euros in 2016. • Women now hold 38 percent of managerial positions. • Shareholders will receive 0.145 euros gross per share against the 2016 results, 11.5 percent more than the previous year. Accelerating digital transformation, deepening the analysis of less profitable businesses, strengthening the distribution network, and signing agreements with distributors in specific markets are some of the areas that MAPFRE will focus on in 2017 to grow and maintain dividend yields of approximately 5 percent, announced MAPFRE chairman and CEO Antonio Huertas at the annual general meeting. Mr. Huertas also announced that in 2017, through more than 160 projects already underway, the company will make further progress with solutions to help intensify MAPFRE’s digital transformation, in turn helping to improve technical performance and build customer loyalty. “On the basis of sustained and profitable growth, we are pushing forward with a transformation within the company that will place us at the front of the pack in terms of technological, operational, and service aspects,” Antonio Huertas announced. As evidence, he announced that digital business grew by 23 percent in 2016, double the objective set for the year. Digital transaction volume in the company’s main markets (Spain, Brazil, the United States, and Mexico) was up by 19 percent, compared to an objective of 30 percent for the three-year period 2016-2018. In the context of advancing digitization, VERTI will commence operations in the United States in the second half of this year, serving as a launch pad for accelerating MAPFRE’s digital transformation in the United States. Additionally, this year will see completion of the restructuring of the direct business in Italy and the transition of direct business operations in both Italy and Germany to the VERTI brand. In his speech, MAPFRE’s chairman and CEO stressed the importance of boosting profit margins, and provided some examples of how this can be achieved. In Spain, the company will work to grow above market levels by making progress in attracting clients, building loyalty and cross-selling. In the United States, the company will focus its efforts on those states where it has potential to improve profitability and it will curb growth plans or stop underwriting in the rest. Finally, in Mexico, MAPFRE is continuing its internal restructuring process and reorganizing its business activities in order to return to satisfactory profits. MAPFRE will also implement a new pricing system for automobile and health insurance in Mexico. In addition, less profitable businesses (essentially the automobile insurance line) in countries like Mexico, Brazil, and the United States will be analyzed. In addition to advancing its multi-channel approach, MAPFRE will continue with its plan to develop proprietary networks in Latin America. Specifically, in Mexico, the company will incentivize the recruitment of new intermediaries, and create a specific network for personal risks. Meanwhile, in Central America and the Dominican Republic, MAPFRE will push the development of new agents and representatives. Additionally, in Latin America, MAPFRE will seek to form distribution agreements with financial entities, automotive and distribution companies, among others. In Brazil, the company will also implement remote sales models within the Banco do Brasil network and will sell healthcare assistance products for companies. The reinsurance business will grow in specific markets, such as those in APAC, driven by new office openings planned for this region. At the same time, in EMEA and the United States, the company will continue with the development plan for life reinsurance. The global risks business will enhance its presence in Europe, North America, and Asia in order to increase geographic diversification. As for MAPFRE Asistencia, the company will proceed with its operational reorganization strategy, maintaining the focus on strategic markets and businesses with potential for sustainable growth and satisfactory levels of profitability. The chairman and CEO recapped the objectives for the three-year period from 2016-2018 and confirmed that revenue growth could ease off, on the back of the profitable growth strategy, as happened in 2016, and also because of reduced financial income as a consequence of low interest rates. Nonetheless, premiums will continue growing at expected rates (also driven by the strengthening of some currencies). The ROE is also expected to improve, exceeding 11 percent in 2018. Appreciations in the US dollar and Brazilian real, together with low interest rates in Europe make meeting the initial objective more demanding. The objective of delivering a dividend yield of approximately 5 percent with a payout of between 50 and 65 percent of Group earnings remains unchanged. The combined ratio stood at 97.4 percent in 2016, compared to an objective of 96 percent for the three-year period, and Mr. Huertas stressed the importance of increasing efforts over the next two years to meet this objective. The expense ratio was 27.4 percent, compared to the average three-year objective of 28 percent, showing the success of the cost reduction plan, with annual savings of more than 60 million euros (compared to an annual average forecast of 50 million euros). With regard to the objective of having women hold at least 40 percent of managerial positions at MAPFRE by 2018, the chairman and CEO announced that the company has already reached 38 percent. People with disabilities comprise 1.4 percent of MAPFRE’s global workforce, which shows real progress is being made toward the objective of 2 percent by 2018. In addition to approving the 2016 accounts, the shareholders’ meeting also approved the appointment of Francisco J. Marco Orenes as executive director, confirmed Fernando Mata Verdejo and Ana Isabel Fernández Alvarez as directors, and reelected Adriana Casademont i Ruhí as a director. Furthermore, the dividend against 2016 earnings was approved, totaling 0.145 euros gross per share, which includes 0.06 euros per share already distributed as an interim dividend. 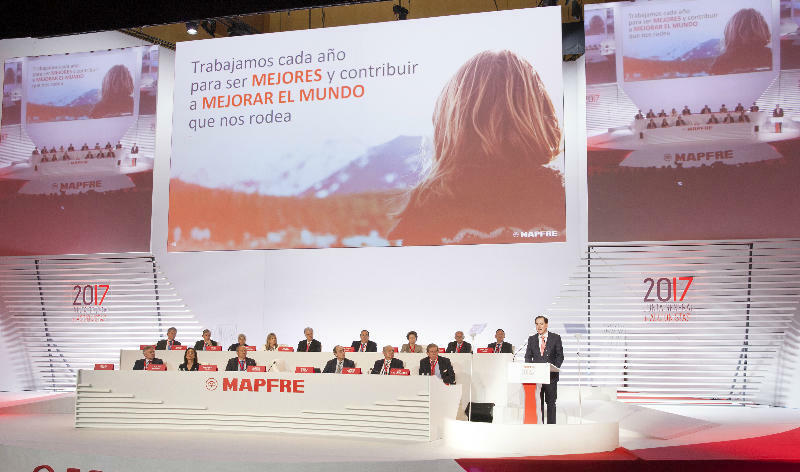 MAPFRE will allocate 447 million euros to be paid out to shareholders from 2016 profits, up 11.5 percent on the previous year, increasing the payout from 56.5 percent to 57.6 percent over the last twelve months.